I’ve been considering penstemons lately. Penstemons have proven to be excellent garden plants because of their drought tolerance, long bloom time and nectar production that attracts favorable wildlife such as hummingbirds, honeybees, and bumblebees. There are many that are native to the western states thriving in rocky, barren soils, but the eastern states also have a few that boast the same desirable qualities. The following are some of my favorite penstemons. Penstemon smallii is a northeastern native typically found in light shade in well- drained woodlands from Georgia to North Carolina. Being hardy to zone 5, it adapts well to growing farther north. It boasts lavender flowers late spring to early summer and will often rebloom if deadheaded. The foliage is medium green often with a rosey hued rim. The color of the leaves deepen when given some shade. Out of all the penstemons listed here, Penstemon smallii will tolerate the most shade. Grow in part shade to full sun. Height is 18-24” with a spread of 12”. Penstemon digitalis ‘Husker’s Red’ blooms earlier than P. smallii. It performs so well in the garden it was named Perennial Plant of the Year in 1996. It has tall flowering stems (24-30”) with light pink to white trumpet flowers. The foliage emerges a showy burgundy green and lightens to green as the season progresses. Penstemon digitalis is native from the middle of the US to the Atlantic. Grow in full to part sun in average soils. Penstemon hirsutus var. 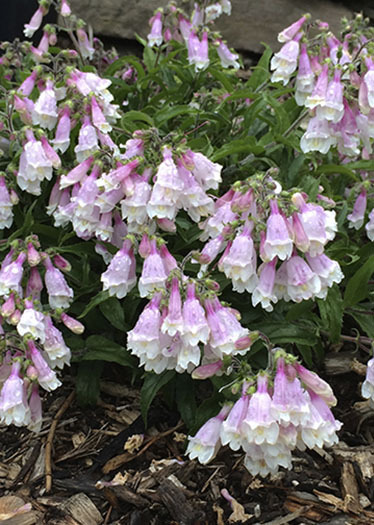 pygmaeus is a fun, shorter penstemon that likes to “bop” around the garden. Plant it on a hillside, rocky ledge, wall, or at the edge of a walkway or patio, and it will bloom profusely then lightly seed in the open spaces around and below it. Reaching only 6-8” in flower, it makes a lovely little filler. Penstemon hirsutus is native to the northeastern US. 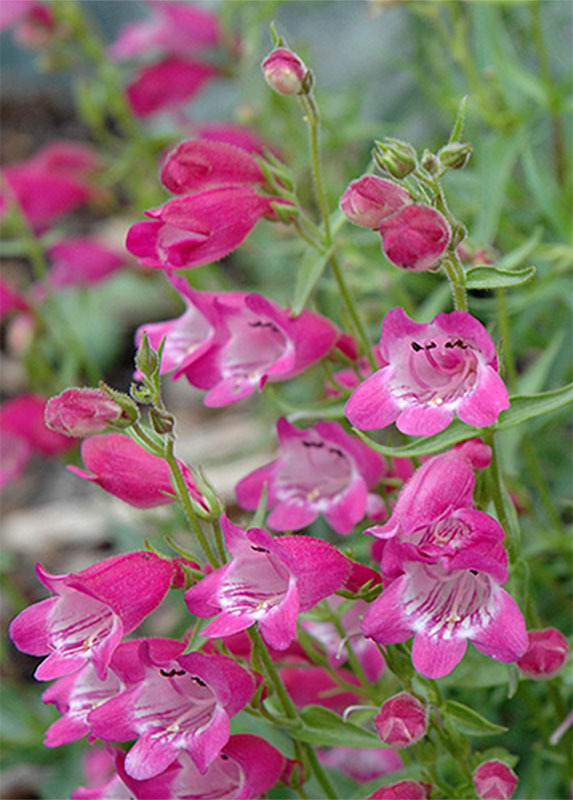 Penstemon ‘Red Rocks’ was recommended to me by a professional gardener. Any plant recommended by someone who gardens for most of their waking hours gets my attention. 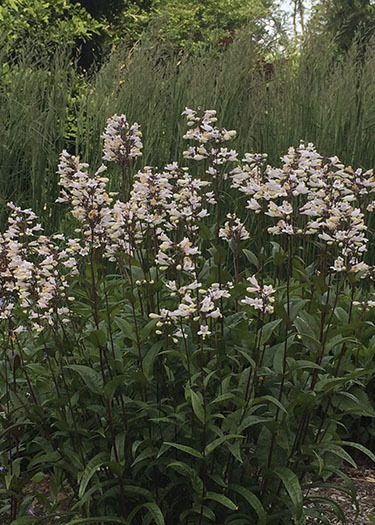 This penstemon is believed to be a cross between Penstemon mexicali and a US penstemon. It grows 12- 18” and boasts large deep rose flowers with a white lip. It is very showy. Keep it deadheaded, and it will bloom all summer. All of these penstemons attract hummingbirds, bees, and other pollinators. They are even deer resistant! Include some in your plantings and you will surely be rewarded with extra life and beauty in your garden.